Bowling shoes are specially made shoes for bowling that can be quite different from your average pair of trainers. Instead of having a grippy rubber sole, the goal of bowling shoes is for them to be as slippery as possible. 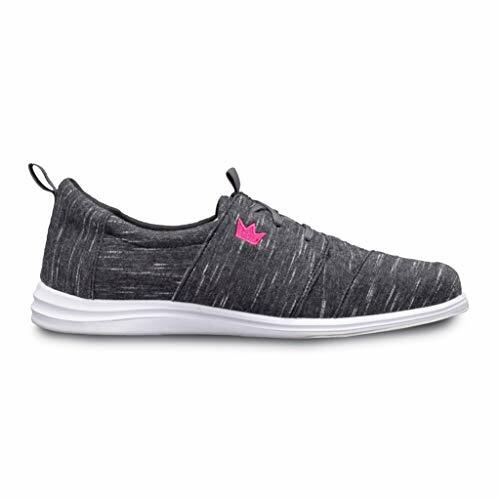 They typically look quite similar to standard sneakers, but have more of a heel, less grip, and more comfort, breathability, and flexibility. For the most part, they are also heavier. Finding the best pair of shoes for your needs is no easy feat. You have to look at each component of the shoe to see whether the features are going to work for you. What’s more, because you are buying them online, you are always going to take a risk. The best thing you can do is research. Check out these nine options below, followed by purchasing considerations, so you can increase your chances of buying the perfect pair. You can then head to the bowling alley and show the other players who’s boss! If you have narrow feet and you’re looking for attractive bowling shoes that will stand out from the rest, then check out this pair from Storm. With a white, black, and multicolor color scheme, they are going to be the first thing many people spot at the bowling alley. However, the appearance is only the first of many wonderful features. You get to choose from eight sizes then enjoy the comfort and durability of them. Even if you wear them daily, they are a pair of shoes that are made to last. They also feature a synthetic upper U-throat, S8 microfiber sliding soles, and a non-marking rubber outsole. However, you may also need to use EasyGlide products as they still have a bit of grip. They are lightweight, come with raised heels, and are reasonably affordable given the quality and longevity. They are more suitable for people with narrow feet, but if you fit the bill, then you are bound to enjoy this pair of shoes. Wearing rented bowling shoes is fine if you only go bowling once in a blue moon, but if you’re a frequent flyer, it’s worth upgrading to a new pair from Dexter Kerrie. These grey twill shoes are every little bit as excellent as they look in the pictures. They have a sleek and stylish color scheme – unlike the garish variety you hire – and they are comfortable to wear. What’s more, they aren’t stiff and uncomfortable like some shoes when you wear them for the first time. The size variety is also fantastic, meaning you are going to find a pair to suit your foot size. However, the sizing does run small and they are more suitable for people with narrow feet than those with broad feet. When it comes to their sliding ability, they tick all the boxes here too. They feature S8 microfiber soles and a Slide-Rite outsole with non-marking rubber, so you can rest assured they are suitable for any bowling alley. If your feet sweat normally, they are less likely to do so thanks to the medial side vents. 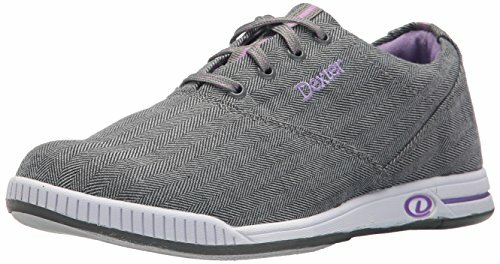 The cotton canvas uppers, cushioned tongue and collar, and the removable footbed all add to the value and comfort of this pair of bowling shoes. Say goodbye to rented shoes for good. 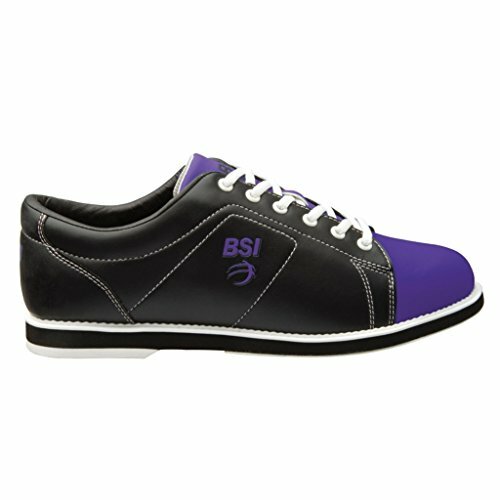 If you don’t anticipate needing to have bowling shoes for very long, or you’re merely testing the waters with this new hobby, then check out these women’s bowling shoes from BSI. They look the part, are packed full of features, but may not last as long as other shoes on the market. The durability leaves a significant question mark over whether to add these to your shopping cart or not. 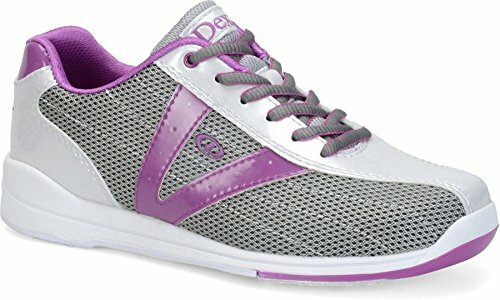 The white and purple color scheme makes them a wonderful wardrobe addition, while they are also comfortable too. However, several people note how they fall apart quickly. In saying that, they come with plenty of sizing options, an excellent sliding outsole, and there is premium amounts of padding to suit your comfort levels too. What’s more, they are lightweight, comfortable, and even have a sock insole lining. Without a doubt, this pair of shoes will generate interest, but it remains to be seen whether they are a pair worth purchasing due to some people’s problems with seams coming undone. Even though these bowling shoes are not the smoothest pair in the bowling alley, they are still going to become a firm favorite with many women. They are affordable to buy, come in eight different sizes, and for most people, are true to size. When it comes to comfort and style, they are leagues ahead of others too. They come with a molded removable blown EVA footbed, non-marking rubber soles, and a defined heel that’s comfortable and built to last. Even the color scheme will impress, featuring contemporary mixes of color that help you to stand out from the crowd. They are also flexible, lightweight, and breathable – three things you wish for in a pair of bowling shoes. Even though they are quite low in the ankle and the outsole needs some work, that doesn’t make them any less worth going into your shopping cart. This pair of bowling shoes is packed full of so many features that it won’t take long for you to be adding it to your shopping cart. Even though the jean material might not be for everyone, the suitability for all feet types and a full sizing range makes it a desirable pair of bowling shoes all the same. 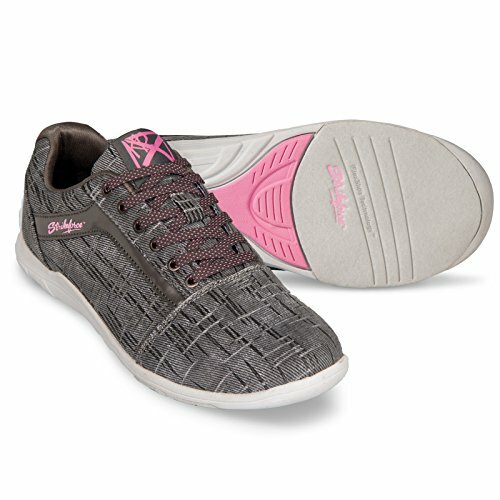 You get to choose from ten shoe sizes of this Nova model shoe and enjoy the unique style that goes with them. They also have rubber outsoles, a KR canvas upper, and a comfortable sock liner that will impress. The CMEVA low profile sole is also a standout addition, as are the FlexLite and FlexSlide technologies. Finally, the white microfiber slide pad, lightweightness, durability, and breathability will all have you smiling. This pair of bowling shoes – for people with narrow and wide feet – will be a standout on the market. You may find that these bowling shoes are not as slippery as others on the market, but given their extensive range of features, they are still going to be a pair you may like to consider. You can buy them in seven different sizes to suit wide and narrow feet, and enjoy the white, paisley, and scarlet color scheme. Apart from their style making them stand out from the crowd, their comfort, durability, and technology will too. They feature Komfort-fit construction so you won’t have any trouble wearing them in, and the man-made upper and padded tongue and collar make for an enjoyable wearing experience. The raised heel, non-marking rubber soles, and FlexSlide technology all complete the picture, with the microfiber slide pad and EVA mid-sole giving you peace of mind that this pair of bowling shoes will perform. They are by no means the best shoes on the market, but if you are getting tired of rental shoes, or you’re looking to get into the sport competitively, they are an excellent stepping stone. This stylish pair of bowling shoes for women from Brunswick will turn heads the first time you head to the bowling alley. Not only does their striking two-tone color scheme of black and white or blue and white stand out, but so too does the quality. Unlike other bowling shoes on the market, there are varied fits to suit. You not only get to pick from 18 sizes, but two fitted options of regular or wide. Very few other bowling shoes on the market give you that choice. Many are only even suitable for people with narrow feet. They are also slippery, comfortable, and are not stiff when you wear them for the first time. Instead, all you need to do is stretch the toe box and they are ready to roll. Whether you’re a novice bowler or you’re getting into the sport competitively, you may keep coming back to these bowling shoes time and time again. 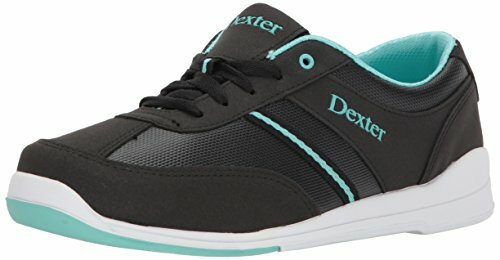 If you want to stand out from the crowd at the bowling alley, then these bowling shoes from Dexter can help you to do that. 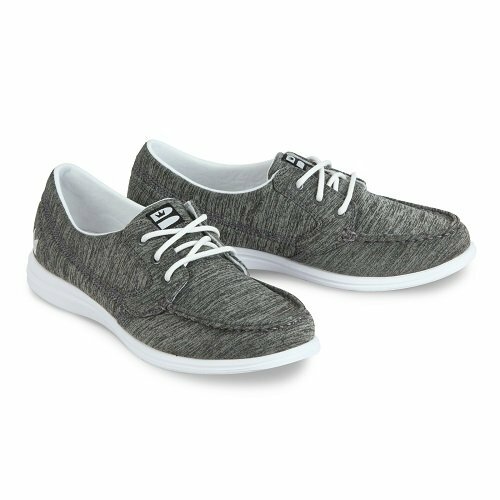 As the Ana model, they feature plaid upper graphics, a suede upper, and plenty of lovely touches for comfort, durability and style. It’s clear to see these are bowling shoes that are well worth your consideration. All components are man-made, and you get to enjoy fabric lining for breathability and comfort, a padded collar and tongue, and a raised heel to give you that edge. They also have a U-throat pattern to seal the deal. 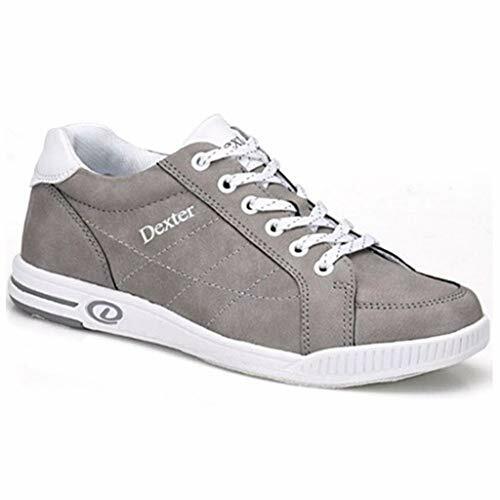 When you go to step out and take your turn, the outsole, premium rubber, and overall performance of these bowling shoes are bound to impress you. People may even ask you where you bought them! When you’re looking to upgrade your current pair of bowling shoes, or you’re tired of rentals, check out these plaid bowling shoes. 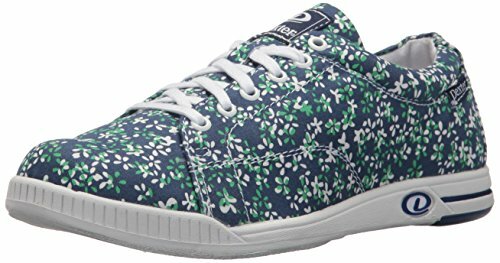 If you consider yourself a professional in the bowling scene, or you merely want to skip entry-level bowling shoes and get right into the big leagues, then this pair for women from Hammer are well worth a closer look. They may not have the affordable price tag of some more affordable options, but they far surpass many of them with regard to quality. Once you buy these bowling shoes, you may never want to switch to another brand again. The first standout feature is the variety. You not only get to choose from three sleek color schemes, but 12 sizes too. The full range of sizes can prove invaluable if you typically struggle to find a pair to fit. This Vixen model pair of bowling shoes also has a full range of features that will give other brands a run for their money. They have a microfiber upper which is breathable, a CMEVA outside, and an Ortholite insole. This eclectic combination means you can be at the top of your game when you hit the bowling alley. The mesh tongue and collar also add to the comfort, something that helps when you’re wearing the bowling shoes for extended periods. Then, when you want to slide around effortlessly but with control, these shoes can help here too. They feature top-of-the-range technology that will impress time and time again. The H-Bar heel locking system, interchangeable slide pads, and microfiber slide pad all contribute to the entire experience. If you are in the market for new bowling shoes, don’t look past this pair from Hammer. Think about how much effort you put into choosing a standard pair of dress shoes or trainers. You don’t pick the first pair you see, even if they say they are for completing a particular task. Therefore, you wouldn’t do the same when you are buying a new pair of bowling shoes. Just because they are for bowling, doesn’t mean one style of shoe is going to tick all the boxes. If you would prefer not to go through the hassle of returning shoes that don’t fit or don’t work for you, then read on. We have included a few considerations below to make it more likely to get the pair of bowling shoes that suits your needs the best. The second-most important consideration are the outsoles – the layer on the bottom of the shoe. This part helps you to move around freely without gripping to the floor and potentially messing up your turn. The best type of sole is replaceable, but you can also check out comments from real customers to find out whether they are too grippy, not grippy enough, or just right. Buying shoes online can be tricky at the best of times, but it can be even more so with bowling. The shoes need to fit perfectly because they have a job to do. That’s why the most significant consideration to make is in the realm of sizing. Firstly, choose a sizing from the list that you believe is the same as your shoe size. Then, find that size on the manufacturer’s sizing chart. Get out a tape measure and measure your foot. If that size doesn’t fit – even if it’s your regular size – go up or down a size. Also consider whether you have a narrow or wide foot to match the shoe. Guesswork can only lead to you having to return the shoes. The price tag tends to be representative of the bowling experience level. If you are entering the bowling market for the first time, you don’t have to pay a lot. However, you also only get an entry-level shoe. If you are a professional, then you have to pay a bit more. The more you pay, the better quality and more advanced the bowling shoe is. How the manufacturer constructs the shoe can end up making all the difference to how happy you are with them. The better the materials involved in the manufacturing process, the longer they will last. What’s more, you may like to pay attention to customer reviews and photos. They are a fairly good indicator whether a shoe is quality or not. Entry level shoes tend to not last as long as professional shoes, but their material quality can sometimes surprise you as well. When in doubt, find out from the source – the customer. Finally, bowling shoes have to be comfortable, flexible, and breathable. If you are not happy with how they fit, feel, and react, then you will not want to use them. A manufacturer can say they are comfortable but, once again, the best source of information will be from customers who have purchased them before you.